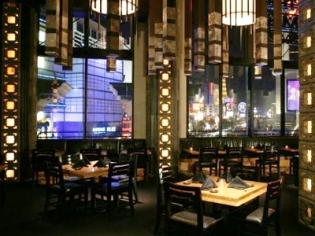 Zen-like atmosphere, modern Japanese fare, incomparable sushi; yes, you have found Sushi Roku! The menu features traditional sushi and innovative maki. Zen-like atmosphere, modern Japanese fare, incomparable sushi; yes, you have found Sushi Roku! The menu features traditional sushi and innovative maki. An array of sakes and cocktails made from house-infused vodkas will compliment your cuisine choice. Choose from the dining room, the lounge or the tatami room to enjoy the views of the Strip. If sushi is not your craving, never fear, an array of signature specialties round out the menu such as grilled lamb chops or Kobe beef. Be sure to inquire about the “High Roll-er” if you want to tell all your friends about the “Golden” time you had in Vegas! The restaurant has a warm, grotto-like feel that will make a romantic night special, or relax you after a day of shopping in the Forum Shops. Special lunch menu with bento boxes, sushi six assortments and bowls. I would like to try a few other sushi places out here, but this one was pretty decent. I really liked the food, but its not a cheap joint to grab some sushi. The quality of the food was about the same as several from back home, but with a much steeper pricetag. We sat down and had some blueberry saki shots but they were $12 each. Delicious, but again, just costly. If you are looking for both decent quality and good prices, this isnt a place for you. Dont expect to spend much under at least $100 at this location.